In the dead of night, two men steal through the streets of Quito armed with spray cans and a zeal for reform. 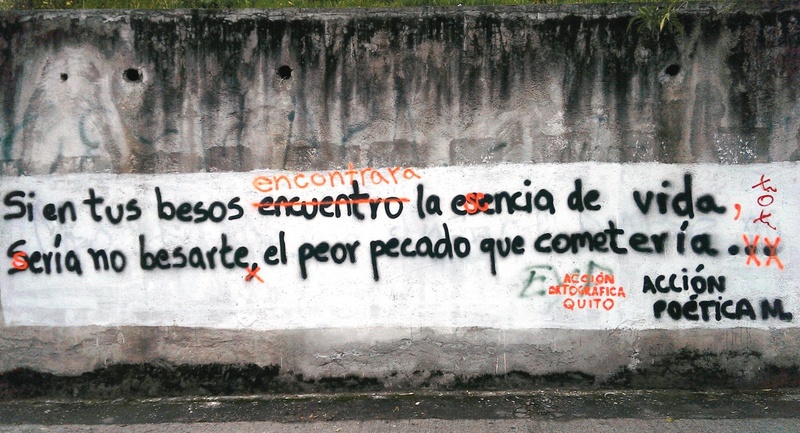 They are not political activists or revolutionaries: they are radical grammar pedants on a mission to correctly punctuate Ecuador’s graffiti. Adding accents, inserting commas and placing question marks at the beginning and end of interrogative sentences scrawled on the city’s walls, the vigilante editors have intervened repeatedly over the past three months to expose the orthographic shortcomings of would-be poets, forlorn lovers and anti-government campaigners. The first images of this guerrilla nitpicking exploded across social networks in December, but despite their global notoriety, the group – Acción Ortográfica Quito – have kept their identities secret and have never given a media interview until now. Imagine swooping through the neon-lit urban landscape with a spray can and that firm a grasp of Spanish diacritical marks. Imagine graffitising the graffiti of protest itself. Imagine just belonging to an organisation called “Acción Ortográfica”. These are lawyers with punctuation-derived street names in their thirties, on a mission to educate and entertain – and judging by the photograph at the top of the page, with an attitude to ellipses that’s almost as hostile as IMDb’s. And yet … in the light of the just-departed National Grammar Day, and its gleeful celebration of nitpicking, this also feels like going a little bit too far. Shorn of the wit and the big-city coolness, is this actually any better than Lynne Truss’s grumpy attempts to assault greengrocer’s signs with a felt-tip pen? Item: It is not your job to correct misused apostrophes or other errors in signage. Resist the temptation … keep in mind that English has many dialects, each with distinctive properties. Let a hundred flowers bloom. And that’s the problem. There are, as descriptivists are fond of saying, “many voices”, of which formal English is only one. Indeed, it’s more than one: as You Don’t Say goes on to observe: “Just as there is no one English but a variety of dialects, there is not even one standard written American English, but a spectrum.” Graffiti is written English, but not formal English. It doesn’t need to be entirely correct. Very formal English – the kind found in our venerated 18th and 19th-century usage guides – is little more than a collection of antiquated grammar, mistakes, Latinate superstitions and quixotic innovations. But however dubious its antecedents – and they are often shaky or even baseless – it has been, and remains, the English of government, the police, the corporate attorney: the voice of those who have power to command. Fowler’s suggestion on “which” and “that” in restrictive clauses has found its way into more than a dozen state legislature drafting manuals. Copies of Strunk and White are, or were, sent out to those newly admitted to the bar of the 11th Circuit Court of Appeals. Unsplitting infinitives, moving prepositions away from the end of the sentence, using “whom” in the right place: in the most formal circumstances, these are not just superstitious efforts at “correctness”, but something more: they are a raising of the rhetorical stakes, an appropriation of the register in which the most serious matters are discussed. Relationship therapists teach something called “tone-matching” to help people who struggle to get their point across in arguments. If someone is polite, you are polite. If someone becomes curt, you become curt. If someone raises their voice, you raise it too – not more, not less, but exactly the same amount. The capacity to detect and respond to changes of tone is an essential part of doing well in disputes, and the same applies to writing as it does in speech. Litigators don’t use slang, and neither do leader writers. The register they use might crumble to dust on close inspection of its antecedents, but it still sends a powerful signal: that the matter is grave, and that gravity is expected in reply. And this is why people seek guidance from editors, or Fowler, or Strunk and White. Not for advice on informal English: nobody needs help with that. They need help with formal English: they need their tone to match the tone of their interlocutor. They need to sound as forbidding to the solicitor as the solicitor sounds to them, or as authoritative and competent to a new employer as a successful candidate should. So, if a friend applying for a job asks you whether it should be “whom” in the sentence “My former employer was Joe Dough & Co, from whom you may obtain references”, the correct answer is not “there are many voices”; the correct answer, this time, is “yes”. In this context, in this tone, at this stage in the relationship, formality is advisable and “whom” is the correct choice. What is nitpicking and tin-eared in one register is resonant and appropriate in another. As editors, we can weigh audience, tone, register, changing patterns of usage, and still come to a conclusion. We can make those calculations effortlessly: that is why they are asking us. In that sense, the zombie rules of the 18th and 19th century prescriptivists are almost beyond criticism. They have become embedded in the law and the classroom, and in a generation of usage manuals that have still not been superseded in the common imagination. Like so much language change, they were born out of misapprehension and error, and yet have become part of English nonetheless; they are now as much an inexplicable descriptivist phenomenon as surfer slang or the changing meaning of “iconic”. In an English of many voices, formality is a voice too.